So many new vegan bloggers to welcome into the fold! One such blogger is Poppy. Here she is in her own words,”I’m Poppy and I write Poppy’s Patisserie which is now fully vegan. I was a vegetarian since the age of six and have now been a vegan for almost two years. I am a University student studying Animal Management based in Kent, UK. I love food and especially love experimenting with new ways to eat plant based foods, full of goodness and flavour. I also love animals. I have two lovely sibling cats, ten bunnies, three chickens and five degu’s. They are great fun. 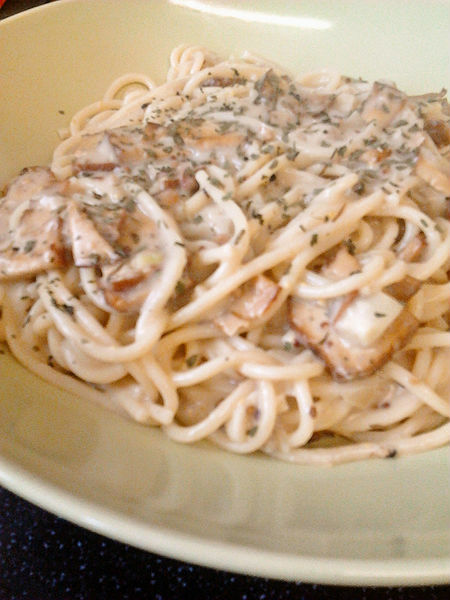 Below is a post I’d love to share for a vegan carbonara style spaghetti using smoked tofu. It’s a real favourite of mine, comfort food full of goodness.” Follow Poppy on Twitter – welcome Poppy! I’ve never eaten a real carbonara with bacon but have always been a sucker for creamy pastas. I remember once making a veggie version with veggie bacon and cream; it tasted delicious but I felt sick from the heaviness of the cream. I tried again with a traditional egg sauce but was so frightened of eating raw egg that I ended up cooking it to almost scrambled egg coated pasta. Yummy. Not. So when it came to having a go, now vegan, I had no idea how it would turn out. 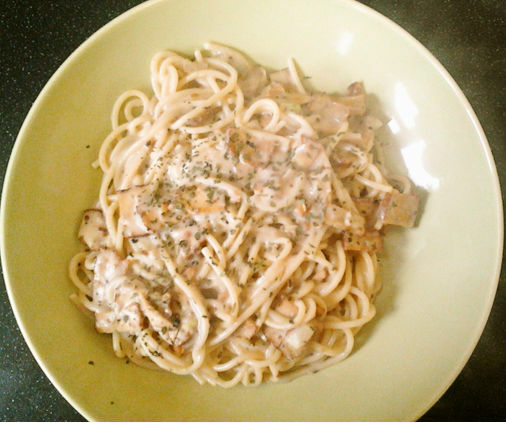 Of course, any Italian pasta purist would shoot me for even describing this as a carbonara, but then again, so would they of my cream abundant version or even my version using the traditional ingredients which led to a spaghetti omelette. Hey ho. 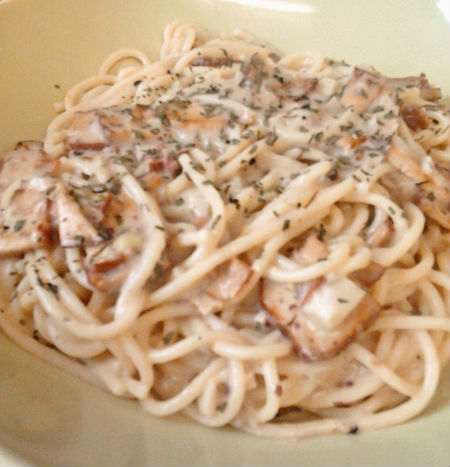 It’s rich yet not too heavy, tastes smoky and creamy and is low in calories. What could be wrong with that? Put a pan of salted water on to boil. Once boiling, add the pasta. Spray or add a drop of oil to a pan and add the shallot over a low heat to soften. If using mushrooms, add now also. Once softened, remove and set aside. Set the heat to high and add the tofu. Fry until fragrant and starting to crisp and go golden. This should only take a minute or so. Meanwhile, melt the spread in a small pan over a medium heat then stir in the flour. Cook the roux, stirring, for about a minute. Gradually whisk in the milk until all is incorporated and smooth. Add in the mushroom powder (if using) and allow the sauce to thicken, stirring often. Season to taste. Stir in the shallot (and mushrooms, if using) and tofu. 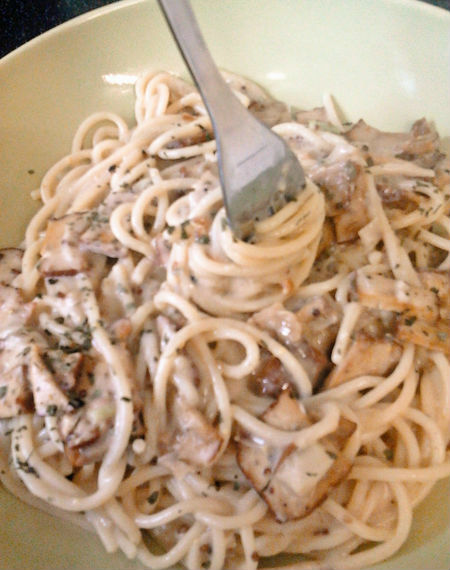 Toss the sauce with the drained pasta and serve sprinkled with finely chopped chives. This is a keeper – going right into my recipe file!! Like others have said, I am really excited about this recipe and can’t wait to try it out.